There was also a housing boom and bust in the 1920s, which was probably a contributor as well. At this point, there’s little doubt that financial crises and large asset bubbles cause economic slowdowns, even if economists don’t know the precise reason that this happens. But why did stocks and housing crash in the first place? Irrational exuberance, and the natural dynamics of asset bubbles, undoubtedly played a part. 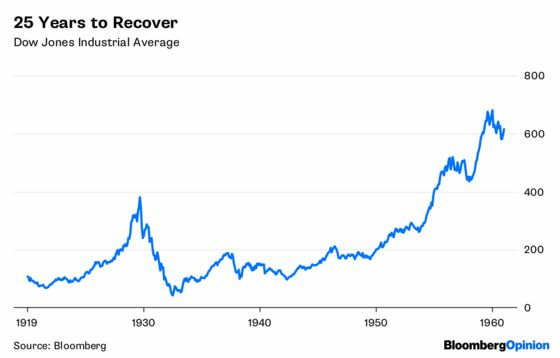 But it’s also possible that government policies contributed to or triggered the crash, by slowing economic growth below what investors in the 1920s had expected. One possible culprit is the Smoot-Hawley tariff, a version of which was passed by the House of Representatives in May 1929 — a few months before the stock market crash. Smoot-Hawley provoked some retaliation from U.S. trading partners, and was eventually followed by a general wave of protectionism during the 1930s. Some of those restrictions probably were a misguided response to the Depression itself, but some might have been retaliation for Smoot-Hawley. The stock-market crash may well have been touched off by investors realizing that a global trade war would hurt the earnings of U.S. companies. A 1928 tightening of global monetary policy also could have served as a trigger. But the crash also might have been influenced by another policy enacted in the 1920s — immigration restriction. What was the effect of that dramatic drop in population influx? It almost certainly reduced long-term economic growth. Fewer workers mean that fewer goods and services get produced. Fewer consumers mean that there’s less demand. Immigrants are like a natural resource; in the same way that cutting the supply of oil or steel hurts growth, reducing the flow people also limits the economy. The negative economic impact of immigration restriction probably goes beyond this simple reduction in inputs. Larger, more dense populations of workers and consumers create what economists call agglomeration effects, where businesses and their suppliers and customers all clump together and benefit from being near to each other. This is what makes productivity — and wages — higher in big cities than in small towns. By starving growing cities of workers and consumers, immigration restriction can put the brakes on this virtuous cycle of agglomeration. Areas [where immigration was more] restricted by the quota system experienced larger population declines in the subsequent decades as the quotas reduced the supply of immigrants to these areas…[T]he quotas led to negative agglomeration effects in the manufacturing sector…We also find that the quota system pushed native workers into low-wage occupations. It naturally follows that if the 1924 law hurt local economies, it hurt the national economy as well. The housing and construction industries would naturally be some of the hardest hit, since immigrants need places to live. A recent paper by economists Doruk Cengiz and Hasan Tekguc found that letting Syrian refugees into Turkey stimulated residential construction in the cities to which they moved. It therefore stands to reason that the 1924 Johnson-Reed Act led to the exact reverse of this effect. The housing crash of the mid-1920s might well have been a direct result of the curtailment of immigration. 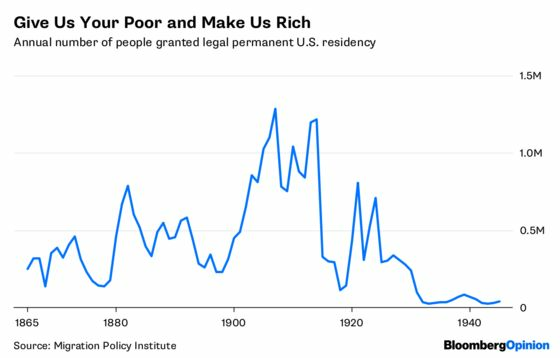 And if the Great Depression and/or the stock crash of 1929 was caused or exacerbated by that housing crash, there’s a clear and direct link between immigration restriction and the U.S.’s worst economic crisis of the 20th century. The reduction in agglomeration effects reported by Ager and Hansen probably also contributed to lower corporate earnings and sapped vitality in American cities. So as President Donald Trump continues his efforts to dramatically restrict legal immigration to the U.S., it’s important to remember the last time this was done, and the economic carnage that followed. Immigration restriction might not touch off a huge recession this time — the bursting of the housing bubble a decade ago might mean there’s not as much of a bubble to be popped — but the economic consequences will be negative nonetheless. The mistakes of the 1920s should be a cautionary tale, not an example to emulate.